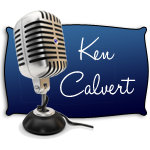 Ken Calvert » John Heffron is a Comedy Power Bar! Think about it, Detroit has produced some pretty, pretty good talent. Mike Binder, Tim Allen, Dave Coulier, Thom Sharp and John Heffron. On this podcast, I just get out of the way and let John take the controls. Enjoy the ride!